Dental implants can be used for a wide range of treatment. One implant can replace a single missing tooth, two implants can secure a loose denture, or multiple implants can be used to replace all the teeth in the mouth. Implants remain the most effective and longest lasting solution available and have been used to restore smiles since the 1960s. Dental implants treatment in Staines is available at Thorpe Lea Dental. We use the Straumann Implant system – one of the most tried and tested precision implant systems in the world. An implant comes in two parts. The first is an artificial root made from ultra-pure titanium that replaces the root of a missing tooth. It can be placed in either the upper or lower jaw and in time will bond with the jawbone. The second part is what is attached to the dental implant root. For those missing one tooth, a crown will be created to perfectly match your existing teeth. If you have a full set of dentures, this can be attached to four or six dental implant roots – you don’t need one implant root for every missing tooth you have. Dental implant treatment is a minor surgical procedure that is carried out under local anaesthetic and has been performed for many years, with an excellent success rate. Once your new implant has been placed we normally wait around three to six months to allow full healing, then we can place a new tooth. Over time, dental implants prove to be the most cost-effective solution for replacing missing teeth. We offer flexible finance options, such as interest-free credit. Most people aged over 18 and in reasonably good health can have dental implants. Our thorough implant assessment will determine whether dental implants are the right option for you. At your implant assessment consultation, your mouth would first be examined and then appropriate x-rays, models, and photographs taken. If implants are appropriate, a full treatment plan would be developed together with an estimate of the costs of providing the treatment. Dental implant treatment starts from £2,500 and finance options are available. Over time, dental implants prove to be the most cost-effective solution for replacing missing teeth. Do you suffer from mouth irritation, problems with speaking and eating, dry mouth, excessive saliva or unstable dentures that make you feel insecure? 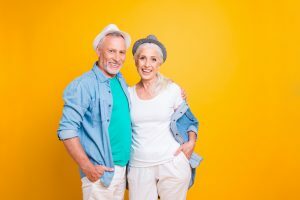 There is a solution – you can restore your taste, smile and confidence with dental implants from Thorpe Lea Dental in Surrey. Our experienced implant dentist has been successfully placing dental implants for many years for patients in Staines, Virginia Water, Sunbury, Wraysbury, Shepperton and beyond. Implant retained dentures are fixed and secure, allowing you to live your life to the full. Depending on how many teeth you have missing, we can ‘bridge’ between implants. If you have four teeth missing in a row, we could place two implants at each end and suspend two teeth between them. If you have no teeth at all, then it is possible to provide a new full set of teeth with just four implants. Dental implants from Thorpe Lea Dental in Staines, Surrey, provide a long-lasting solution to missing teeth. A small but strong post used in place of a missing tooth root, dental implants allow patients to chew and eat with ease. Dental implants look, feel and work just like the real thing. They can replace one or more missing teeth and securely hold dentures and bridges in place. Our experienced implant dentist has been successfully placing dental implants for many years. We’re always delighted by the amazing, life-changing results achieved.